It’s interesting what can cause someone’s skin to crawl. My husband (Mr. Cool as a cucumber) is deathly afraid of spiders. They don’t have to be any bigger than a dime and he consistently reacts with a full body shudder. He feels the same way about snakes and moose. My problem is rodents. I’d like to think I could pick up a hamster or a gerbil but honestly, I would rather die. The mother of all rodent fears for me are MICE. I am the lady jumping up on a chair, using a straw broom to swat them away. They give me the heebie-jeebies. Years ago, Graeme and I were checking on a mouse trap we had set up in the back mudroom. I went first, Graeme behind me. How I ended up leading this investigation, I don’t know. We quietly tiptoed slowly into the room, turning the corner when I thought I saw something scurry past the shelving. I screamed and panic-ran to the other end of the house with my arms flailing. Graeme followed my lead, letting out a high pitch scream, even though he didn’t witness a thing. We laughed hard. Funnily, Graeme is not afraid of mice. 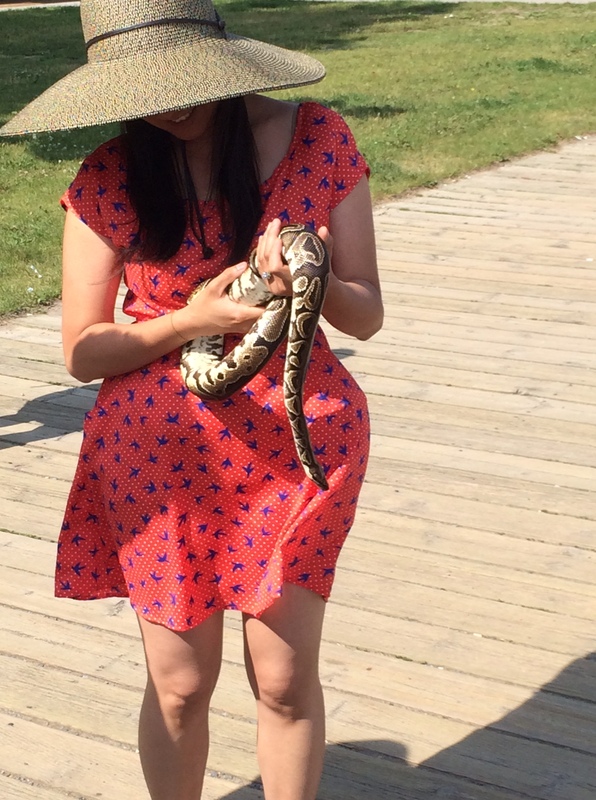 Me, not afraid of pythons.